Alocasia or ‘elephant ear plants’ are fantastic foliage plants with huge leaves up to 1m long. Alocasia macrorrhiza is known as the giant taro, giant elephant ear or upright elephant ear and is a popular species. Alocasia x Amazonica ‘Poly’ is pictured right. Preferring some protection from direct sunlight Alocasia do well in a part shaded but light position. A warm climate and a well drained potting mix is best. Alocasia are really a tropical plant that require warmth throughout the year. All varieties do well as potted plants indoors. Alocasia macrorrhiza var. brisbanensis is native to the coastal rain forests of QLD and NSW . Valued in landscaping for its large glossy green heart shaped foliage. This is an understory plant and grows well in moist dappled shade, reaching around 1m – 1.5m with small white scented flowers. Alocasia wentii is regarded as a cold hardy species and more suited to southern states, large green leaves shaped like an elongated heart or arrow head are green on the top and a bronze / purple underneath. It will go dormant when the temperatures drop, and does require a moist but free draining soil. 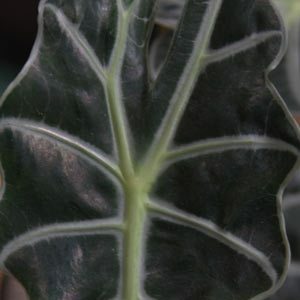 Alocasia x Amazonica is the ‘African Mask plant’ and has deeply veined foliage, dark with pale green, this one does require warmer climates and is usually ‘indoors only’ in cooler areas. Alocasia Moroco – Deep green foliage with silvery markings, the reverse is a deep maroon, stems are an attractive deep red. Largest online selection of tropical exotic plants in Australia. Heliconias, gingers, cordylines and brugmansias. Retail center open by appointment only.